Today is the feast of Our Lady of Mount Carmel. On July 16, 1251, our Lady appeared to St. Simon Stock, in Kent, England. She gave him a scapular for the monks to wear all the time and told them that "Those wearing this scapular shall not suffer eternal fire." 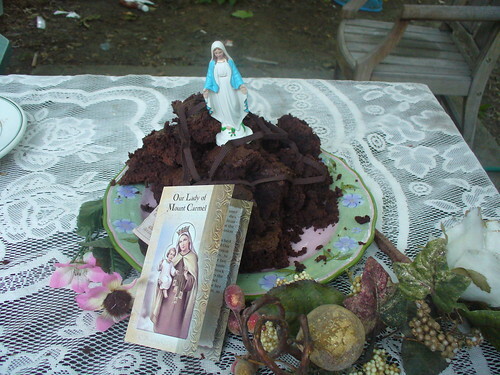 So why is this the Feast of Our Lady of Mount Carmel instead of Our Lady of Kent England? Well, there's a story to that. Mount Carmel is a real place in Palestine. Carmel or "Karmel" means garden. This region was considered a lush garden and a place of beauty. In the book of Judith, King Nabuchodonosor sent his general to "bring all the earth under his empire." The inhabitants of Carmel were able to resist this invasion. Judith eventually kills the general in his own camp. 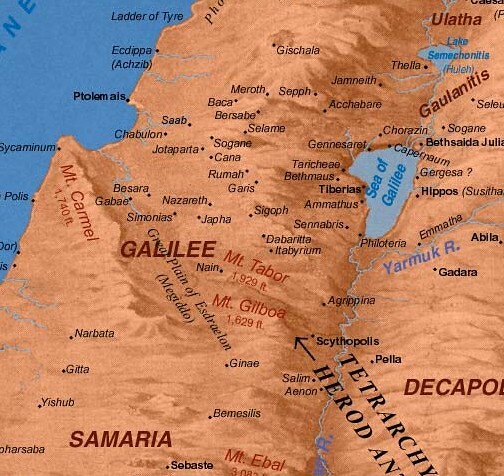 The Prophet Elijah lived on Mount Carmel and attracted other men to come and live a life of prayer and sacrifice. In the 12th century, many men came from England to live as Elijah and to honor the Blessed Mother. Chapels to the Blessed Mother have been built on Mount Carmel, and this is where the Carmelites lived. Around 1235, the Carmelite Order had to move back to Europe after persecution and incursions by the Saracens. Later, St. Simon Stock, born in England in the mid 1100's, joined the Carmelite Order in England, where there was great devotion to the Blessed Mother. He became the general of the Carmelite Order, and spent several years in the monastery on Mount Carmel. The Order spread through Europe, and on January 13, 1252 Pope Innocent IV gave official recognition to the Carmelite Order. after moving back to Europe, the hermits found difficult to adapt to new lifestyle. St. Simon Stock instituted reforms to best suit Western conditions and the cenobitical rather than the eremitical way of life. 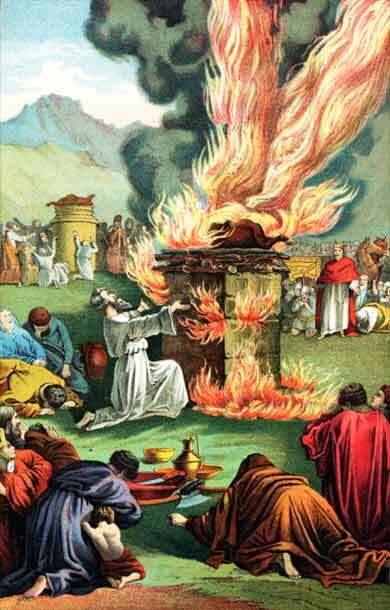 However, the order had difficulty gaining general acceptance and suffered much persecution and oppression from secular clergy. 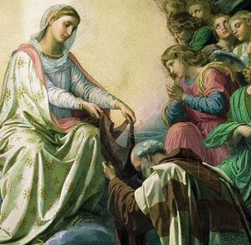 Since then, the Brown Scapular of Our Lady of Mount Carmel has become a favorite with Catholics all over the world, many popes and saints wearing it daily. 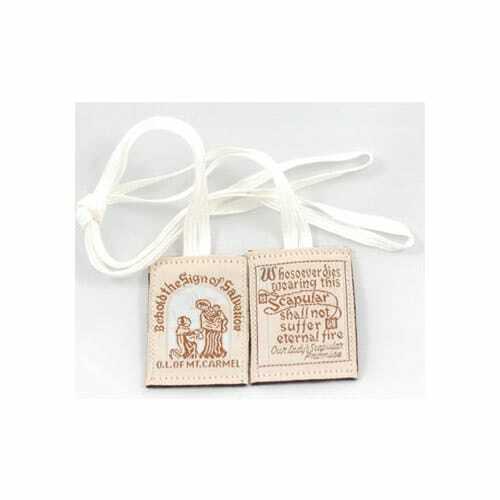 The Church has granted many spiritual benefits to the wearing of the Brown Scapular. Another prayer to Our Lady of Mount Carmel is the Flos Carmeli (Flower of Carmel) composed by Saint Simon Stock. O Beautiful Flower of Carmel, most fruitful vine,splendor of heaven, holy and singular, who brought forth the Son of God, still ever remaining a pure virgin, assist us in our necessity! O Star of the Sea, help and protect us! Show us that you are our Mother! Our Lady of Mt. Carmel, pray for us!